The word espresso conjures up images of a romantic getaway. You are sitting at a Parisian sidewalk café quietly sipping a little espresso with your lover. The world quickly passes by, but you do not mind. You have your espresso and your romance. Back to reality. You love espresso but find it too hard to make. You want to enjoy that thick robust taste of coffee but do not have the time. It is a good thing that there are the best inexpensive espresso machines on the market. You can enjoy a great cup of espresso without breaking the bank. We know that the decision to purchase an espresso machine is not easy. Our review will guide you to the best inexpensive espresso maker on the market. Of course, the definition of inexpensive is relative. One thing we will tell you. We picked the Breville BES870XL Barista Express Espresso Machine as the best affordable espresso machine. You will need to read on to find out why. To fully appreciate an espresso machine, you need to understand what actually is espresso. There are many ideas about espresso and few ever agree. What is agreed upon is that the term espresso simply is a general category word. It describes the process of making the coffee. Another agreed upon factor is the texture of the coffee. It is thick concentrated coffee that is topped by a white creamy foam. Even the cheapest espresso machine can make espresso. There is no real difficulty to brewing up a cup. The ingredients are tightly packed coffee and water. The machine simply forces the water through the tightly packed coffee. A brief amount of time and a lot of pressure is also vital to the process. That is all there is to making a great cup of espresso. It used to be that you reserved enjoying a cup of espresso for your European vacation. It was a special treat that made your holiday stand out from all the rest. But with the advent of the modern coffee shop, espresso became the ‘it’ beverage to consume. The good news is you do not have to pay the high prices these modern coffee shops charge. For a one time purchase you can own the best inexpensive espresso maker and make your own. It is the convenient, inexpensive way to enjoy espresso. It is not a bean. There is no such thing as an espresso coffee bean. Espresso can be made from any coffee bean grown in the world today. A good cup of espresso depends upon the quality of beans used. Not on using an espresso coffee bean. Another thing espresso is not - it isn’t strong coffee. It is much stronger than that. Also, no other coffee maker can produce the foam that covers an espresso. This version of coffee is in its own category and nothing else compares. The term budget of course is relative. We will review a variety of machines which will fit a variety of budgets. The selection to purchase even the cheapest espresso machine is not easy. There are just too many kinds of espresso machines on the market. We have narrowed our review down to what we think are the top 5. Hamilton Beach is a trusted name in home appliances. The company has made quality home appliances for decades. They got into the best inexpensive espresso maker market because they realized you can’t spend a lot of money on espresso every day. They have taken the espresso machine to the next level by allowing you to add water to the reservoir without turning it off. Hamilton Beach also provided a choice in how you can fill the coffee bucket. You can use ground coffee or a simple to handle coffee pod. Two must be their favorite number. You can brew two cups of espresso at the same time. You can enjoy a great European espresso every day with this machine. Without paying the high price modern coffee shops charge. If you get tired of espresso, you can use the milk frother to make a great cup of cappuccino. Hamilton Beach has put a 15 bar Italian pump into their espresso maker. Just do not over pack the coffee grounds. Its simple push button controls allow just about anyone to make a great cup of espresso. This espresso maker is not difficult to clean. It comes with removable drip tray, cup rest, frothing nozzle, filter holder, brew head and water reservoir. Just a little warm water and soap and the part will be ready to make you another cup. You also get step by step instructions. You never know when you need a little help brewing a great cup of espresso. This espresso maker from Mr. Coffee is very versatile. Produce by a company known for making great coffee makers. Not only can you make espresso, but you can broaden your coffee making talents. This machine will allow you to brew cappuccinos, and lattes, along with a number of different flavor assortments. Its one touch control makes your decision making a lot easier. No mess nor fuss if you want to switch from espresso to latte. The removable water and milk reservoirs make filling each a snap. No need to worry about tight place, just pull out the reservoirs and pour. This espresso maker uses 15 bars of pressure to provide you with that great cup of thick and aromatic espresso. The company recommends you follow some simple steps before using the espresso maker. First do not plug it in right away and make sure the switch is in the off position. Then remove all stickers and labels. Then remove the red plug on the water reservoir. Next hand wash the removable parts. Finally, and very vital, prime the machine first. Soon you will be enjoying your homemade espresso from what might be considered the best espresso machine under $200. It is a good fit for anyone’s budget. This espresso maker is part of a bundle deal. If you like fresh coffee you will get it with this machine. It comes with its own coffee grinder. Take a few minutes to grind your own beans in the morning. 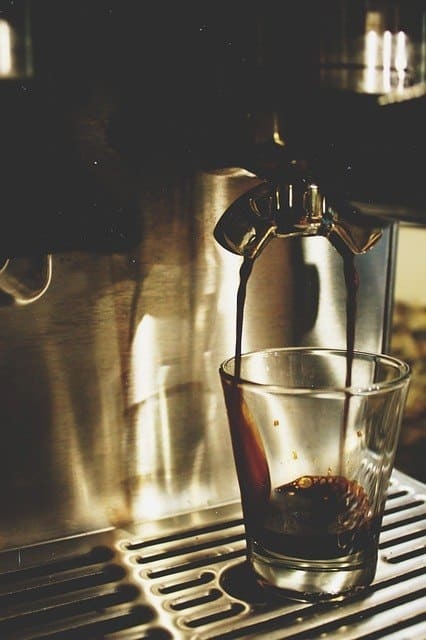 That is the only way to have fresh cup of espresso every day. You also get a stainless steel frothing up and two espresso coffee cups included in this bundle. According to the manufacturer you can have an espresso within 45 seconds. Not bad for a 15 bar pump and a thermoblock heating system. One unique feature is the heating tray. No sense in cooling down your espresso by pouring it in cold cups. You can warm up your cups as you process the espresso. Its LED light indicators will give you the thumb’s up sign when it is ready to go. Worried about it shorting out and causing a fire? No need as it has an overheating and overpressure safety device. You can brew your espresso with complete ease of mind. Worried about to much caffeine? You just need to buy decaffeinated coffee beans or coffee grounds. Good espresso is not restricted to caffeine laden coffee. Probably the best espresso machine under $300. We did say we would review products for a variety of budgets. This espresso machine will fit those people’s budgets who have a little flexibility to them. Right off the bat the most attractive feature is the huge water reservoir. With the capacity to heat up 2 liters of water this little beauty is great for small dinner parties. 2 great features are the built-in bean grinder and the sealed coffee basket. You know you are getting the upmost in fresh coffee with this unit. There is no mess, no spillage, no fuss. Just load the bean grinder and turn it on. The ground coffee empties into the bean basket. This is not your one touch sleepy eyed morning espresso machine. It has 12 additional features which demand you are wide awake when you use it. You can control the grind size, filter size, and much more. You want a professional tasting espresso without paying the price- this machine will give it to you. This may not be the best espresso machine under $500 but it is the best under any price. This espresso machine is for those who like the simple things in life. They are not in a hurry. They can be patient while their machine brews a second separate cup. This machine can do double duty. It can make hot or cold coffee drinks. Have a favorite mug not a problem. This machine will brew your espresso or other coffee favorite in your personal cup. You have a wide variety of coffee styles you can brew. Also, you have a variety of sizes to choose form. You can fill a regular cup, larger one, a travel mug or an xl cup. Get a little flexibility in the strength of your espresso. You control the amount of coffee you want to use. The one touch control delivers the exact amount of water to make the cup of espresso you already selected. No need to worry the machine is automatic. The handy size selector makes selecting the amount of coffee you want easier. Every machine will have its own step by step guide. At least we hope they do. But here are some basic pointers that re basically the same for all machine types. Fill the machine with water - basic, we know yet see above. Replace the portafilter, place a cup under the portafilter opening then start the brewing process. These are just the basic instructions and each step has a little more detail to them. Packing is probably the most important step of the process. Too loose and you will not get that thick espresso. Too tight and you probably get nothing but a mess. Choosing the best inexpensive espresso maker is not an easy decision to make. There are a lot of machines on the market today. Here are a few guidelines to help you make the right choice for you and your budget. Those extra features certainly make a difference in the quality of espresso you drink. Don’t pick an espresso machine because your friends have a great one. Pick one that will fit your budget and technological skills. In our research there was a common thread to all the machines we looked at. The customers all said the same thing no matter if they liked it or not. If they liked it, they all said their machine was the greatest invention since sliced bread. They had no problems whatsoever with their model and can’t understand why someone else got a lemon. If they didn’t like it, the complaints focused on the same problem. There was a reservoir leak, there was a problem in quality of the espresso, it was not durable, the clean light was always on even after cleaning and they would never buy this product again. Fortunately, the good reviews for each product more than doubled the bad reviews. This means if you purchase one of the above products you know you are getting a quality espresso machine. By this we mean you should look for those unique features that set each espresso machine apart from the others. For example we love number 4. Our reasons for this is because of the built in grinder, the enclosed coffee basket, the multitude of functions and much more. We know we can get a professional espresso without being professional with this machine. Also, the large reservoir means we can serve up top quality espresso to our friends at our dinner parties. You do not have to speed a lot of money to get an espresso machine that makes you happy you bought it. You do not have to buy the most expensive one just because we say so or because your friends have one. Get one that fits you and has the features and capabilities you want. Actually, there are none. You do not have to be a professional barista to operate a best inexpensive espresso maker. The simple one touch control espresso machines for under $100-200 do it all for you. You just make sure the coffee is in the portafilter and turn it on. Don’t forget to add the water. You do not need lesson on how to use one or prior experience. You may need practice though. Brewing a perfect espresso is not done first time out. You will make mistakes. Or you may want to experiment until you get the ingredients to where you want them. Either way practice makes perfect. We waited till now to tell you which espresso machine is the best espresso machine out of the ones we reviewed. We didn’t want our opinion influencing your decision making or coloring your opinion. The one touch under $100 espresso machines are the best espresso machine on a budget. But they are not the best machine in this line-up. The under $200 machine is good also but still it does not match the capabilities of our winner. If you haven’t seen it yet there is one machine we think is superior to all the other 4. It is number 4. While we like all the freebies that come with #3 those bonuses do not match the versatility, the flexibility, the capabilities that come with number 4. You can get professional tasting, looking and quality espresso and other coffees from the. Breville BES870XL Barista Express Espresso Machine. We loved everything about it. Even the complexity. The complexity means we can control just about every step of the process and produce the finest espressos anywhere. The large reservoir, the built-in grinder, the sealed coffee basket, the options all combine to make this the best espresso machine in this line-up. Espresso may not have originated in America, but Americans are driving its popularity. Why pay more than you have to at the modern coffee shop? Those companies only care about what is in your wallet. You can deliver the same quality of espresso at a fraction of the price. It won’t be long before the savings you get will cover the expense of one of those machines. You can be the envy of your friends or treat them to a great espresso. What a great way to start your day. A fresh cup of coffee whose aroma will transport you to the Riviera. They will appreciate the savings as well. These espresso machines will make great anniversary gifts, wedding gifts, birthday presents. Your list of the best inexpensive espresso maker may differ from ours. That is okay. At least we gave you a place to start. Before you go and shop, read the reviews. Have an idea of what you want and what you want the espresso maker to do. Don’t go in uninformed. Be ready for the salesman so you do not waste your money.